Admissions by our esteemed Prime Minister that the TPPA will impact on Pharmac’s ability to source cheap, generic medicines from overseas, are deeply troubling. It is not the government that ” will have to pay for the original drug rather than the generic for a little bit longer”. That honour falls on the taxpayer. Those extra costs may be reimbursed by the government – at the expense of other health services which will see their budgets slashed. 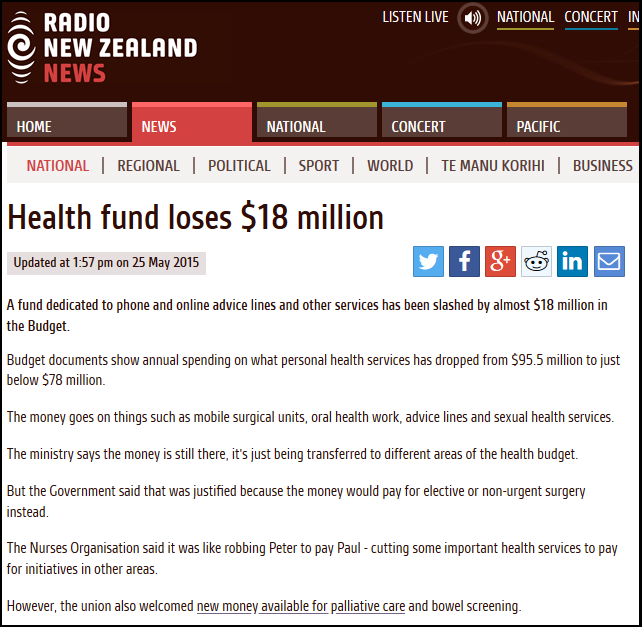 National has a track record of shifting money around in the Health Budget. Will National increase prescription charges again, as they did in 2013? Increasing prescription charges from $3 to $5 hit poor families the hardest. 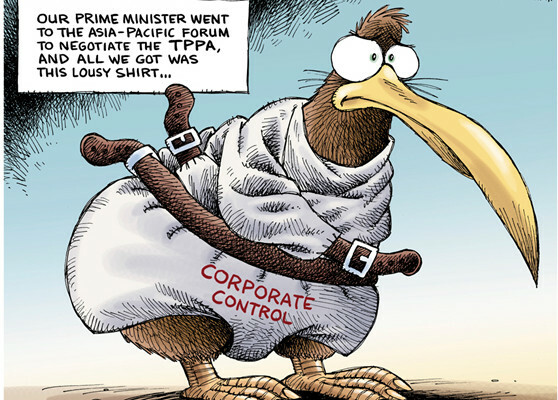 The secretive nature of negotiations have proven that there was good reason to be suspicious of the TPPA. Letter to the editor – More reassurances from our esteemed Dear Leader? Recent admission by our esteemed Prime Minister that the TPPA will likely see an increase in pharmaceutical costs for Pharmac is both disturbing but unsurprising. The secretive nature of the TPPA negotiations hinted at a “sting in the tail” that would impact on our healthcare. It should be pointed out that it is not Government that “will have to pay for the original drug rather than the generic for a little bit longer” – it is the taxpayer. That extra cost for medicines will have to come from the Health Budget and one has to ask what will be cut back? Hip operations for the elderly? Grommets for children? Eye cataract surgery for the blind? National has a track record for shifting money from one area of healthcare to another, to appear as if funding has been “increased” for the lucky recipient. Or will National simply increase prescription charges to cover increased pharmaceutical costs for Pharmac? National has already increased prescription charges from $3 to $5 in 2013 – a move that impacted on the sickest, poorest, and most vulnerable in this country. Not for one moment do I accept Key’s assurances on this issue. He has gone back on his word before, and I expect him to do it again. Letter to the editor – If Serco was the answer, what was the question? Our esteemed prime minister, John Key, recently made statements minimising Serco’s mis-management of Mt Eden Prison. Mr Key defended National’s prison privatisation policy, saying that violence was not limited to private jails. If, as Mr Key maintains, there is no appreciable difference between privately managed or State-run prisons – then what is the point of contracting Serco to run Mt Eden and Wiri Prisons? Why are we taxpayers paying out hundreds of millions of dollars of our money to a private company, when, as John Key tells us, “Mt Eden’s pretty similar to the other prisons”? What is the point in paying this company to do a job no better or worse than our own Corrections Dept? In fact, there seems to be no point. It is a sobering statistic that we try to ignore and put out of our minds; more than 2,800 people are diagnosed with bowel cancer every year and more than 1,200 die from the disease. If that were a death toll from a communicable disease, the media would be carrying front page newspaper stories and lead bulletins on 6PM news. The government would impose a State of Emergency, and strict travel conditions imposed on everyone. Bowel cancer is hidden away. Victims are not acknowledged. People go about their every day lives. Media focuses on sensationalism or trivia (with few exceptions). Government does nothing. The death toll continues to rise. And it is wholly preventable. In October 2011, the Ministry of Health began a four-year-long bowel screening pilot in the Waitemata District Health Board area. The screening was offered to everyone aged between 50 to 74, living within the Waitemata DHB zone, and who was eligible for publicly funded healthcare. Those lucky to be eligible were sent an invitation letter, a consent form along with detailed instructions, and the necessary free bowel-screening test kit. By July 2013, data from the screening pilot detected cancers in seventyfive people within the first fifteen months of the pilot. Around 60% had been picked up at an early stage when they could be more successfully treated. Between 1 January 2012 to 31 December 2013, six thousand people had a colonoscopy or a CT colonography through the Bowel Screening Pilot. By 1 April 2015, two hundred and fiftyfive people had been identified with a cancer. Those are 255 people who might not have approached their medical clinic for a test screening kit, or followed up with a colonoscopy. Those are 255 people whose cancer was detected early, and who had necessary treatment. 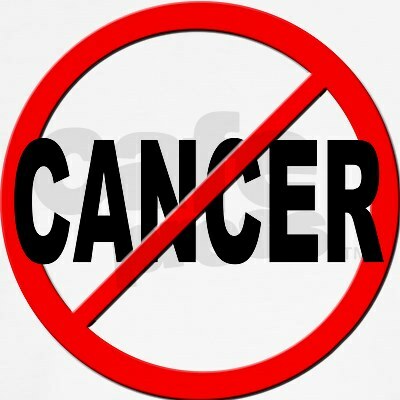 The pilot screening have also picked up non-cancerous polyps (adenomas) and those participants will still be at an increased risk of developing more adenomas or bowel cancer. These participants will require on-going regular bowel checks in the future. The initial four year pilot project, initially costing $24 million, was extended to the end of 2017, with a further $12.4 million invested in the programme. But only in the Waitemata District Health Board area. Those living outside the WDHB are not eligible to participate. That result is from just one DHB “catchement” area. There are twenty DHBs throughout the country. If similar results were obtained from the nineteen other DHBs, that could mean approximately 5,100 people detected with cancer. The government’s response can best be described as slow – at worst, reluctant to invest in a nationwide programme. On 6 July, Health Minister Jonathan Coleman announced a graduated roll-out of a nationwide screening programme. So not only will any nationwide extension of the life-saving screening programme not begin until “early” 2017 – which happens to be an election year (no connection of course) – but at this stage it is still only a “possible” or “potential staged roll out”. At this point, Coleman will be only be taking “a business case to Cabinet by the end of the year”. “We are really pleased that this is happening and that they are talking about a staged roll-out, but we would like to see potential moved to definite roll-out in 2017. There is no feasible reason why Coleman is delaying a national extension of this screening programme that has already saved 255 people. 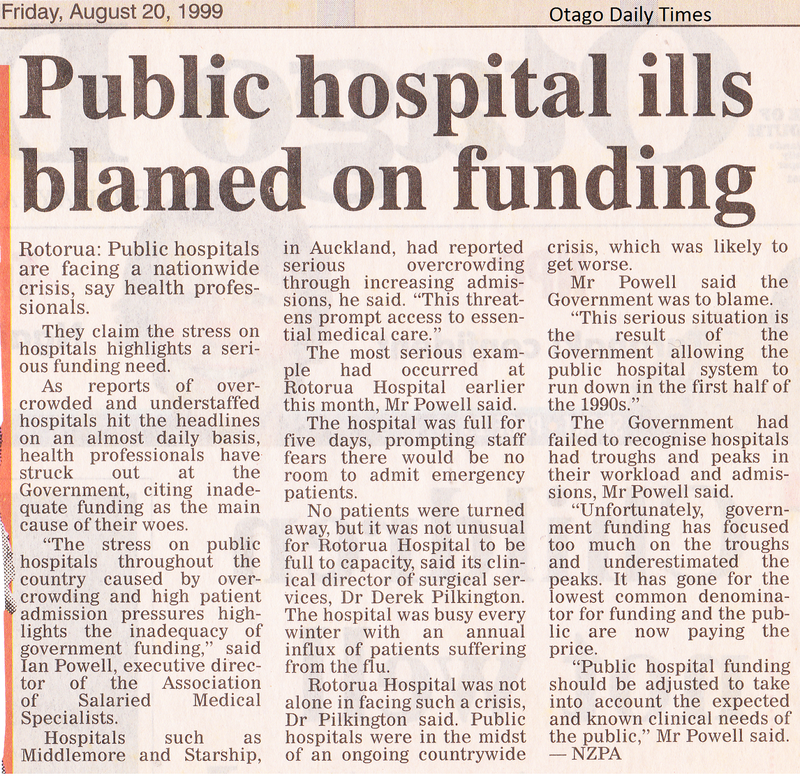 Delaying the roll out condemns hundreds of New Zealanders to a horrible illness and unnecessary death. “The largest constraint to a national bowel screening programme is having the workforce to do the colonoscopies. There are a number of initiatives underway to address this. Yet, the pilot programme has been in operation since October 2011 – giving this government a lead time of five years to begin training required staff. Where was the planning for staffing a nationwide screening programme that was being considered after the Waitemata DHB pilot? 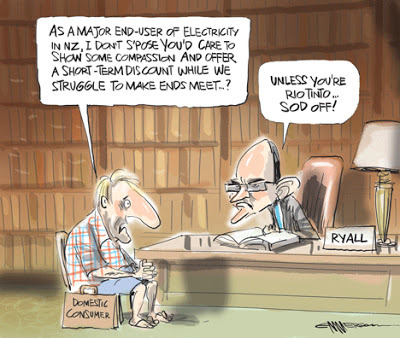 National’s reluctance to spend on much-needed, critical services is no secret. Successive National governments have cut services, whilst giving away billions in tax cuts. Those four examples alone come to $78.5 million that could have been invested in rolling out a nationwide bowel screening programme plus pay for training of required specialist staff. Instead, the money has been spent on a luxury apartment; bribing a Saudi businessman; John Key’s vanity-project to change the flag; and acceding to a multi-national corporation’s demands for a cash subsidy. This is worse than wasting tax-payer’s hard-earned money. 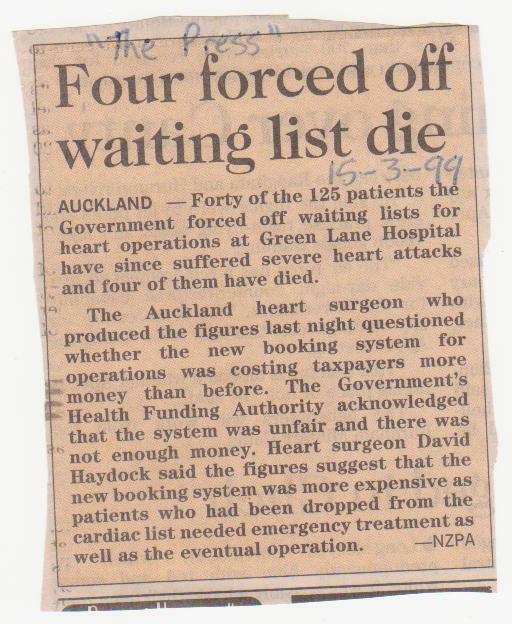 New Zealanders are dying whilst National fiddles and wastes time. I understand that you plan to “take a business case to Cabinet by the end of the year which will consider a potential staged roll out of a national bowel screening programme from early 2017”. Considering that a Ministry of Health pilot programme carried out by the Waitemata District Health Board since October 2011 has saved the lives of approximately two hundred and fiftyfive people who had been identified with a cancer, it seems unbelievable that New Zealanders will have to wait at least another year and a half before a screening programme is rolled out nationally. Surely the training of skilled staff should have been started in 2011, when the pilot programme at Waitemata was initiated? Waiting until the beginning of 2017 means that thousands of people around the country may be stricken by bowel cancer. How many will contract the illness during the time it takes to extend the screening programme? I urge you to re-visit this problem and to begin an immediate, strategic roll-out throughout the country, so that screening can begin to take place. It is simply unacceptable that 1,200 New Zealanders will perish this year; next year; and the year after, when an effective screening programme is available to save their lives. If this government can spend $78.5 million on a Saudi farm; a Manhattan apartment; an aluminium smelter; and a flag referendum – then spending at least half that amount to save lives should not be beyond us. 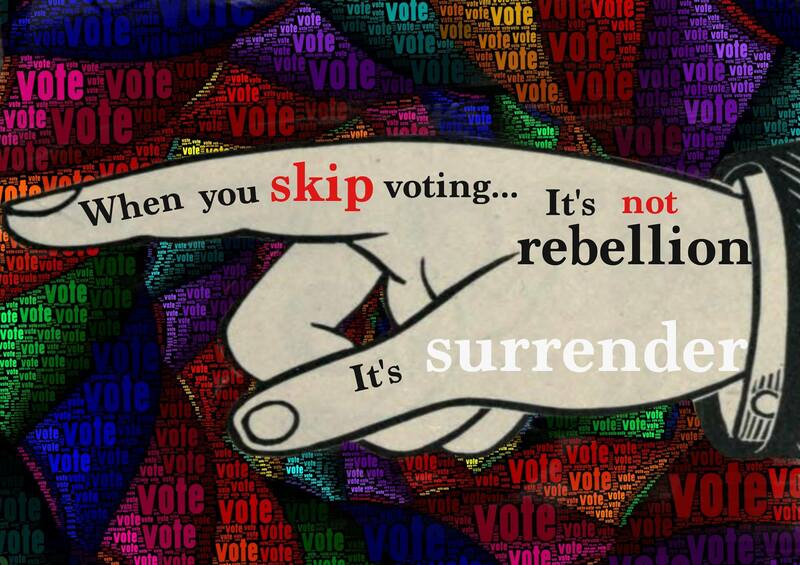 2017 may be an election year – but we should not have to wait until then. Not when thousands of lives are at risk. The Minister has asked Ministry of Health officials to advise him on the matters you have raised. Please be aware that due to the large volume of correspondence we receive, a personal reply to your email may take some weeks. Time, evidently, is not of the essence here. What is truly shameful is not that a National government Minister is prevaricating on this critical medical problem – but that the Minister in question is a qualified medical clinician. He, more than any other politician, should know better. Somewhere in this country, another person has just developed bowel cancer. And doesn’t know it. Ministry of Health: Bowel Screening Pilot results – January 2012 to September 2014 – How many colonoscopies have been performed? Health Minister circumvents law to fulfill 2008 election bribe? This blogpost was first published on The Daily Blog on 22 July 2015. 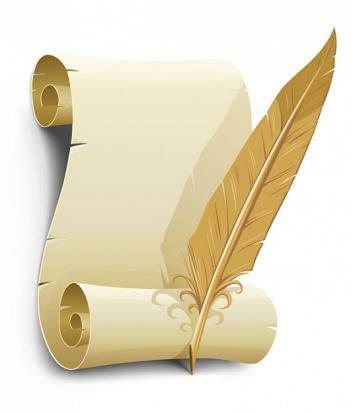 Letter to the editor – John Key’s broken promises, a habit? One can only assume that collapsing dairy prices will impact on tax revenue to a greater magnitude than the government has been advised and English is desperate to look at any alternative income revenue. The sale of State houses was an unmitigated disaster. 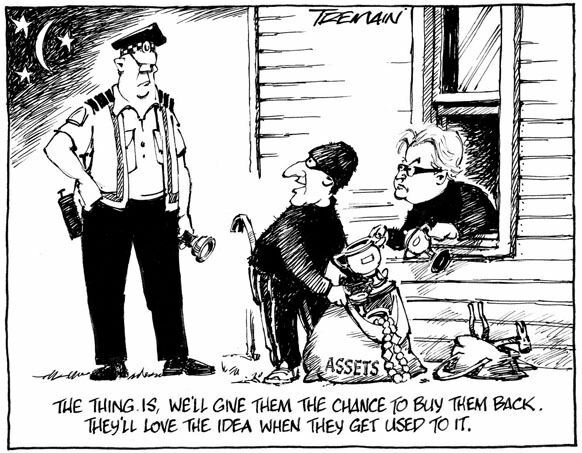 It seems that other State assets may be on the block soon. So much for John Key keeping his word. Past Prime Ministers have created legacies that have marked their contribution to this country. Michael Joseph Savage set up the welfare system and State housing, to alleviate the very worst poverty New Zealand was facing during the Great Depression. Savage would not tolerate the ravages of poverty in a country of plenty like New Zealand. Norman Kirk’s tenure as Prime Minister was tragically cut short due to illness, but during his brief service to this country, he was instrumental in making our opposition to French atomic bomb testing in the South Pacific known to the world. We became a world leader in opposing atomic weapons, gradually moving humanity from the insanity of a thermonuclear war. David Lange built on Norman Kirk’s legacy, and announced to the world that New Zealand would become Nuclear Free. Under his watch, gay equality took a giant step forward, removing homosexuality as a criminal offence – something we now take for granted in the 21st century. What will John Key’s legacy be to this country? Addressing pressing problems surrounding child poverty? Leading the world once again in environmental issues such as reducing greenhouse gas emissions? No, it appears that our esteemed Prime Minister’s legacy is predicated on changing our flag. Not exactly what one might call a pressing problem of our generation.